The health benefits of rosemary are many, and while it has been used medicinally for years, its full potential is only now being fully understood. Since the days of ancient Greece, it's been highly valued for its culinary delicacy, and for its therapeutic effects on the human body. One of the first recorded medicinal uses for rosemary was in 16th century Europe when it was mixed with wine, and given to the Queen of Hungary to help treat her gout. 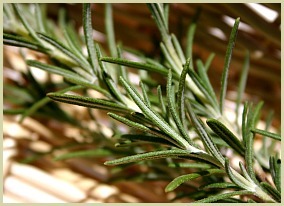 For centuries, the leaves and oil of rosemary plants have been used for their effect on the mind. All around the Mediterranean, it was used to sharpen memory, ward off nightmares, and enhance mental focus. Read more about the plant and its many culinary uses. One study found that the scent, when pumped into an office environment, helped improve worker productivity! Its ability to improve circulation helps increase blood flow to your skin, which helps give you a healthy glow that may make you look younger! It is believed that its powerful anti-oxidant properties could help the body prevent free radicals from damaging cells and causing cancer! It's readily available in tinctures, essential oils, and capsules from health shops. And of course you can use it fresh or dried in your recipes. You can even make rosemary tea. Click here for my simple tea recipe. Whilst safe even in large amounts, people who have iron deficiencies and pregnant/breastfeeding women should speak with their doctor before supplementing with rosemary. To enjoy the health benefits of rosemary, then growing it in pots or your garden is a great way of having a fresh supply of this herb all year round. Click for growing rosemary tips.